Gamespot has uploaded a couple of new Transformers: Fall of Cybertron multi-player demos from SDCC 2012 titled "Dominating Conquest", "Infiltrator and Titan on a Ram" and "Scientist Kill Streak". Check out the embedded videos below. fair enough. looks the same as the first game, just maybe a little more polished. and sadly, still has the " in colour, in sepia purple and grey tones" limit as the last one. The map in the first video is from the WfC, just reworked and retextured. All the announcer dialog seems to be the exact same though. Kinda disappointing. Although maybe I'll give High Moon the benefit of the doubt and assume this is them trying to make Transformers their Halo. In that way it would make sense that the kept the same announcer clips and some of the same maps. I guess Complex is their Blood Gulch. I have been playing WFC for over 2 years and still play today. It is a vastly changed complex not just a reskin. there are lots of new routes you can take and the back areas are completely restructured. Not to mention rescaled! It's in a larger scale as well. 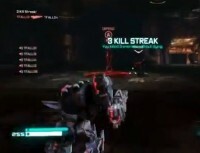 Also seems like there are no kill streak bonuses, as Tomthetfan pointed out to me. Grenades are now an ability. and silverbolt chassis on decepticon"
Great news! so the color restrictions for both teams are a very minor qualm to me then. I'd rather they keep it that way so it's still subconsciously recognizable at first glance whose team who is on. Them mixing up the chassis' will totally get rid of the one thing that really hurt disguise in MP. I hope disguise comes back then! Someone could pull that ability off very well! And Starscream's Escalation ability that's like Ammo Beacon is apparently a pickup on the maps. To replace the overshields that no longer exist, perhaps? Downside, on the Optimus alt-mode chassis that we see played with the infiltrator/scout, is that guy using what appear to be the foc equivalents (riot cannon and chaos rift combuster) of the fusion cannon and magma frag? D: I was really hoping the primary and heavy weapon distinction would fix that. IGN is saying Dinos and "Insectibots" are DLC. Surely there will be some official announcement of that soon. If you watch the Scientist video, he does activate a kill streak bonus. It was the ammo beacon. I think it does not show up till you have hit your streak and then you have to pick it up and deploy it. I honestly did not like horizom much. I prefered Metropolis as my favorite of the DLC maps. The Scientist footage also shows a brand new map as well. Looks fast paced. the details are busier than I expected.